"My girlfriend and I have a soft spot for animals that aren't ... normal." 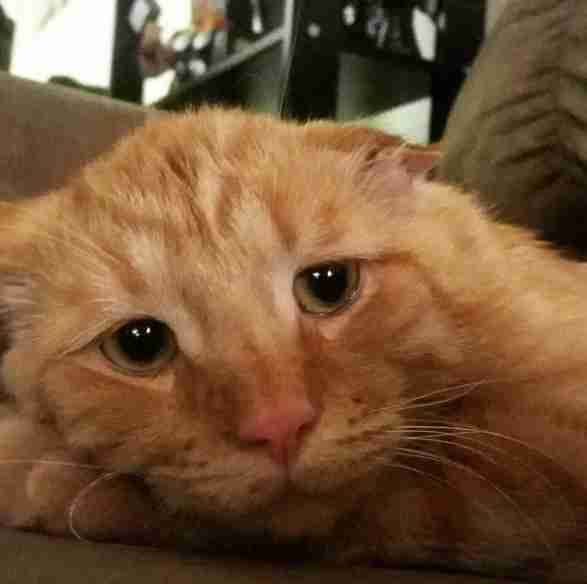 When BenBen the cat was found wandering the streets as a stray, he had puncture wounds, cauliflower ear and a crushed spine. He was in a horrible state, and his chances didn't look good. BenBen was found by an officer with Canada's BCSPCA, and because of his condition, he was taken straight to an emergency vet clinic. After he was stabilized he was brought back to the BCSPCA - but one of the vet technicians at the emergency clinic just couldn't get him out of her head. "I see many traumas in my field of work, and when this little guy came to the clinic I just couldn't let him go," Sandy, BenBen's new mom, told The Dodo. Sandy fell in love with BenBen's adorable face and sweet disposition, and kept tabs on him even after he left the emergency vet clinic where she works. 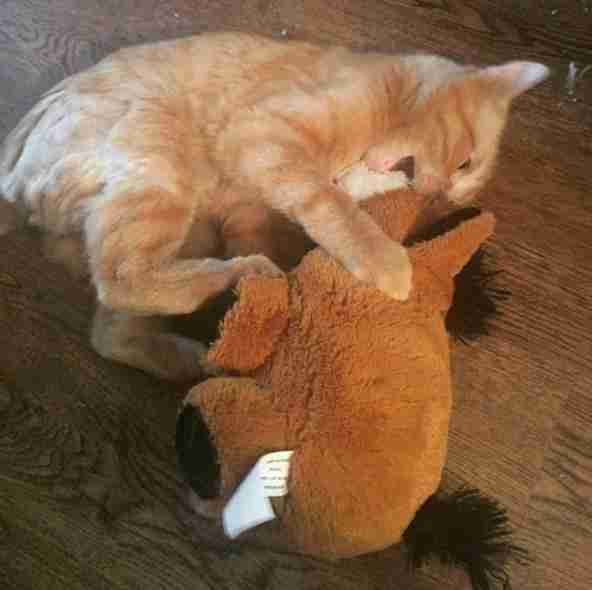 When she told her boyfriend about the quirky cat who'd stolen her heart, he quickly fell in love too. "My girlfriend and I have a soft spot for animals that aren't ... normal," Adam, BenBen's new dad, told The Dodo. "When I first saw a picture of him at the shelter I said to her, 'We need him.' He broke our hearts in every conceivable way. We believed that he needed a chance to live a life." 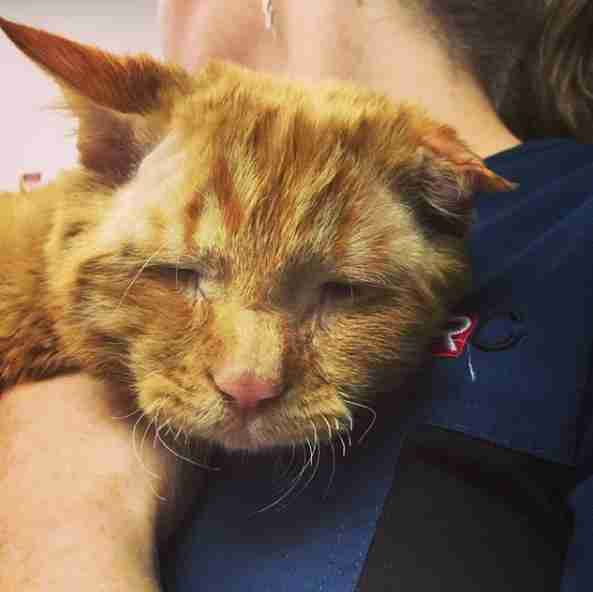 Despite receiving treatment, BenBen's health was still not great. He would have to be on antibiotics for six months after he was rescued, and pain medication for the rest of his life. 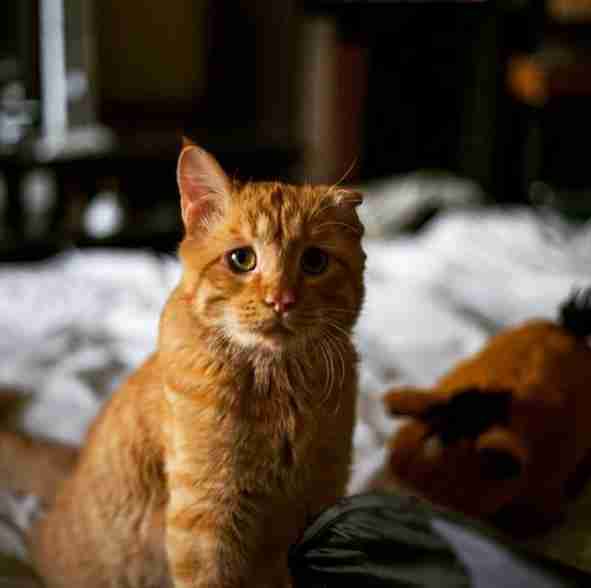 His ear was also permanently damaged. 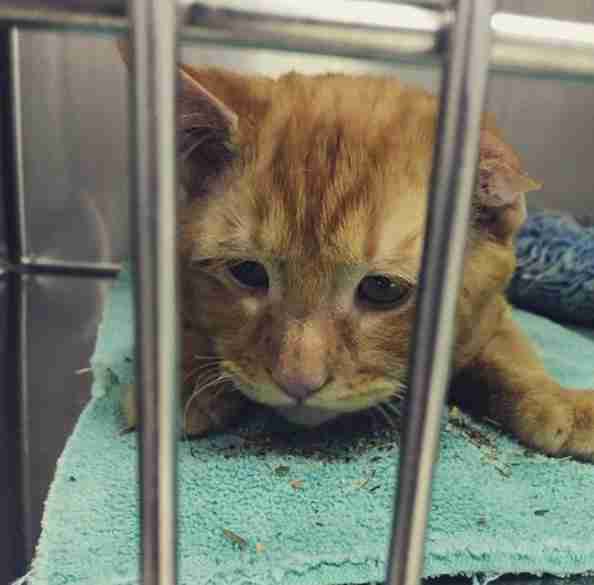 He seemed unadoptable and was clearly in pain, and so the SPCA decided that the best thing to do would be to put BenBen down. But Sandy and Adam decided they couldn't let that happen. "When I found out the SPCA was going to euthanize him we knew we had to give him a home and a chance to be a kitten," Sandy said. "We adopted BenBen because everyone deserves a chance!" Even though BenBen had health issues and was a little different than most cats, Sandy and Adam wanted nothing more than to make him a member of their family. And so, just like that, the cat who seemed like a hopeless case had the best new family anyone could ever ask for. BenBen has lived with his new mom and dad for nine months now, and he's loving every minute of being in his new home. BenBen may have a sad-looking face, but he's really the happiest cat, and loves playing and climbing all over anything he can find. "He looks at obstacles as challenges and will do something repeatedly until he gets it right, like running and jumping on our couch and bed," Sandy said. "He is such a sweetheart!" BenBen absolutely adores people, and when his parents take him out in public, they have a hard time pulling BenBen away from all the new friends he makes. 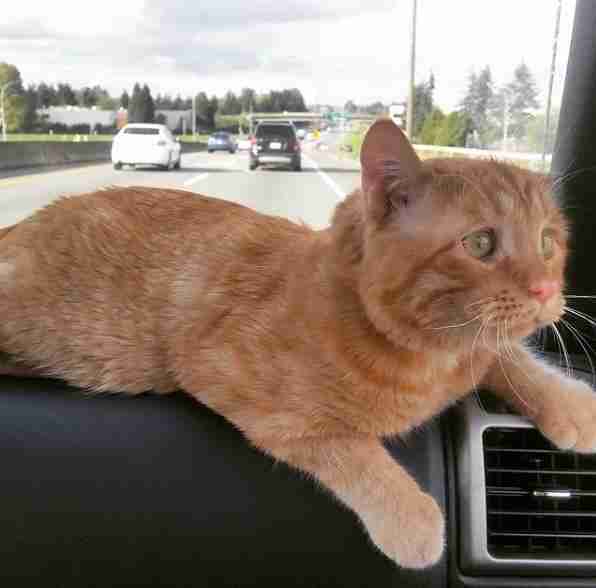 He loves car rides, his huge stuffed animals and discovering new things every day. "To be completely honest, the only thing he DOESN'T like is getting his medication everyday," Adam said. 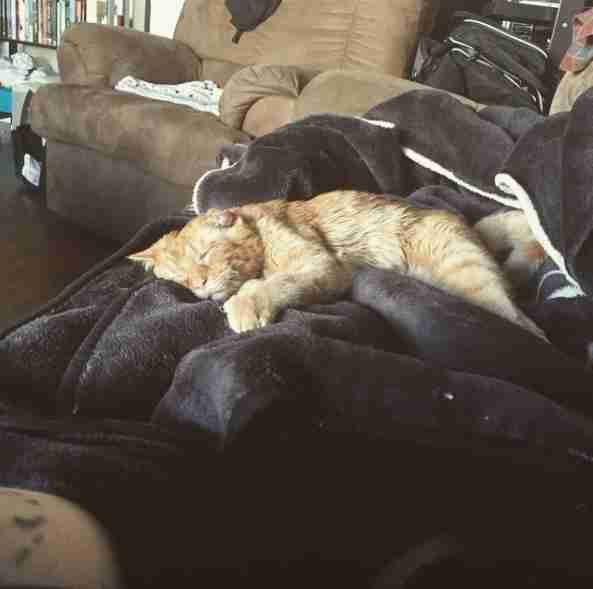 BenBen still has health issues, but the fact that he now has a warm, loving home is making all the difference. "On rainy, cold and damp days he can be a little grumpy," Adam said. "We think the weather bothers him in the same way that kind of weather sometimes bothers people with arthritis and other bone/joint issues. He knows he's loved though. We know he loves us." 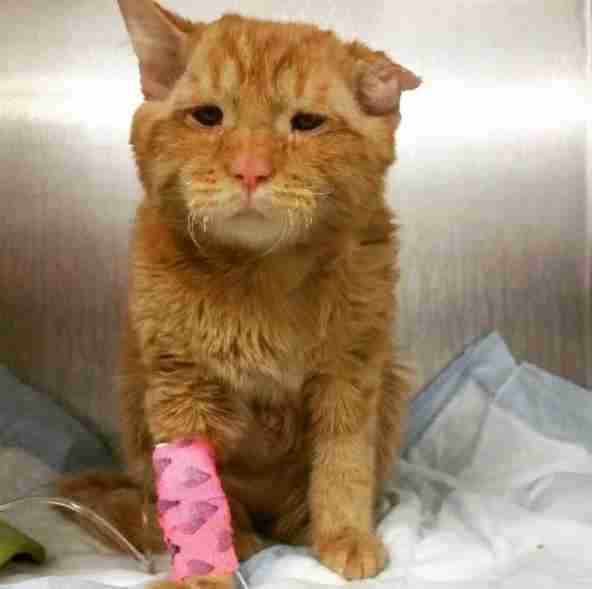 When BenBen was first rescued it didn't look like he had much of a chance, but two people saw past his issues and saw the sweet, incredible cat he is, and that was all he needed.